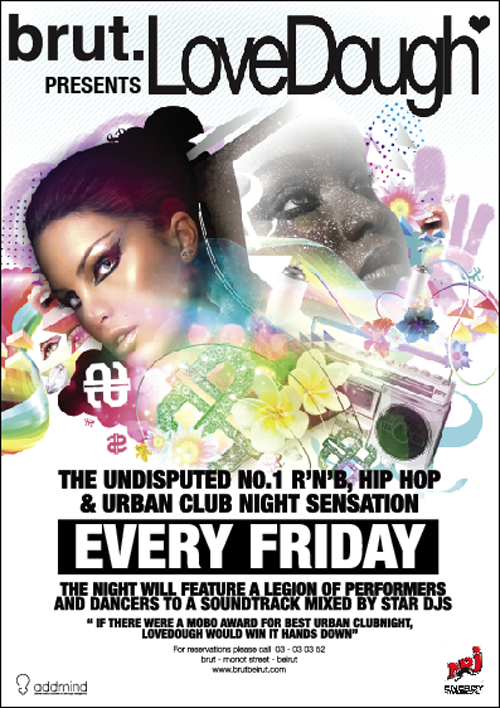 Taking over Beirut every Friday night…Bringing a whole new experience of clubbing to Brut… It’s LoveDough time again!! On Friday May 7, DJ Troopa will be the man behind the decks spinning the hottest RnB & Hip Hop beats all night exclusively @ Brut monot!! DJ Troopa is one of the UK’s most talented up and coming DJ’s. LBA AWARD WINNER FOR BEST CLUB DJ 2010 !! Current Summer resident DJ for; BAZAAR and CLUB ICE (Ayia Napa, Cyprus) 2008 – 2009 Previous Summer residency; CAMELOT CASTLE CLUB (Malia, Crete) 2005-2006-2007 An all round and versatile Urban DJ ….Playing styles from RnB, Hip Hop, Bashment to House(funky) and Garage. DJ TROOPA has played alongside some of the best known DJs & artist’s in the industry such as: MONTELL JORDAN, XZIBIT, LlOYD, SWAY, JAY SEAN, TIM WESTWOOD, ARTFUL DODGER, MISTA JAM, DJ EZ, SHORTEE BLITZ And many many more…He has also played for brands such as Ministry of sound, Twice as Nice, Sidewinder, Musiq and Lovedough to name a few. Don’t miss the successful series of LoveDough at Brut monot this Friday May 7th with DJ Troopa! !